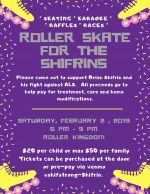 You are invited to “Roller Skate for the Shifrins”. 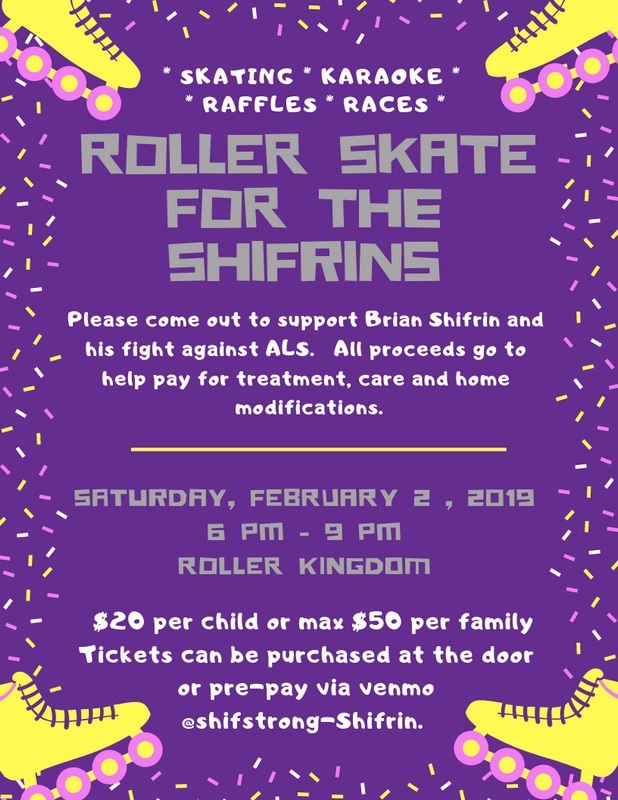 The fundraiser will raise funds to help with expenses to help Brian Shifrin in his fight against ALS. Please come spend a cold wintery night with family and friends roller skating to raise funds for the Shifrin family. Brian Shifrin is a Southborough husband, father & friend who was diagnosed with ALS in 2017. Today, Brian’s disease is progressing where he can no longer be without the assistance of costly care and medical equipment. Roller skate/In-line skate, race contest, 50/50 raffle, DJ, karaoke & snack bar are all part of the fun. Donations with a suggestion of $20 per kid or max $50 per family. Skate rentals are available for $3.00 or bring your own. All proceeds will go directly to Brian’s medical care & equipment bills. PLEASE help make this a #SHIFSTRONG night by bringing your friends and family. Cash, checks to Kristine Shifrin or Venmo @shifstrong-Shifrin – All accepted. Folks have asked about donations… Cash, checks to Kristine Shifrin or VENMO @shifstrong-Shifrin – All accepted. 100% goes to the family. donate by Venmo at @shifstrong-Shifrin Add your kids name in the comments, we can put them to our list. $20/kid or max $50/family. The event takes place at Roller Kingdom in Hudson. You can find more details and updates on the Facebook event page.